Today, Facebook is launching a redesign of its Help Center, with the goal of making it easier for Facebook users to find the information they need and get answers to their questions about the social network’s product and policies. The update includes a new layout and design for the Help Center’s homepage, improved navigation, and the addition of a list of popular questions and top Facebook Pages which users can like in order to stay up-to-date on the topic and related tips. The company also announced that another of its tools, the Support Dashboard, is now available to 100% of Facebook users worldwide. The most immediately noticeable change to the newly redesigned Help Center is the simplified layout, which now features six major topic areas intended to direct users to specific sections of the center. What’s interesting about the design is that the topics shown to users are personalized based on how they’re using Facebook. For example, non-logged in users will be directed to sections about creating accounts or resetting their password. Other topics shown here may include suggestions like “Learn the Privacy Basics,” which directs users to information about how sharing and control works on Facebook, or “See What’s New on Facebook,” which links to an overview of Facebook’s features and products. The Help Center also now showcases some of the popular questions users ask and links to official Facebook Pages for further help, like its “Facebook Tips” Page or the “Known Issues on Facebook” Page, for example. 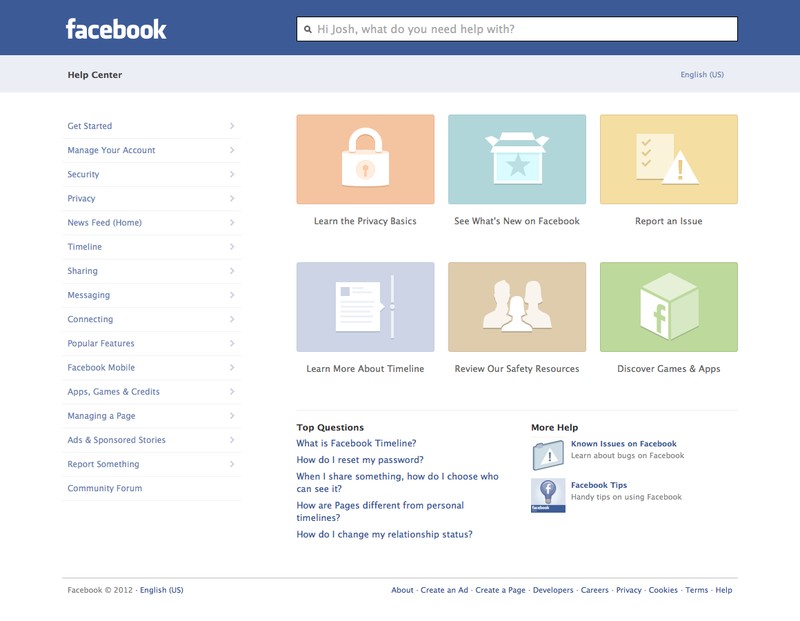 Meanwhile, on the left-hand side of the Help Center, Facebook has introduced new sidebar navigation which points users to various Help sections including Security, Timeline, Privacy, Sharing, Messaging, Connecting, Ads & Sponsored Stories, and much more. Previously, some of these topics appeared on the Help Center’s homepage, but in the new sidebar, several additional topics have been added. Facebook’s Help Center, first introduced in 2007, has undergone many changes over the years, as the network has grown in size and complexity. In February, the company attempted to help frustrated users by offering in-line answers which would appear upon clicking the “Help” link in the top right drop-down menu. These answers were customized to whichever page the user was currently viewing, and beneath them, Facebook offered a link to the Help Center and another which allowed users to “Report a Problem” like bugs, abuse or policy violations. Today, Facebook also reports that the Support Dashboard rollout is complete, and 100% of the Facebook user base should now have access to this tool. In April, Facebook first launched the Support Dashboard, allowing users to track whether their report had been reviewed, whether or not the offensive content they reported had been left up and why the decision had been made. Facebook also sends out notifications to users when the status of their submitted report changes. The link to the Support Dashboard appears in users’ “Account Settings” following their initial report. Facebook, which now has over 900 million monthly active users, is challenged in addressing the questions, concerns, and other support needs from such a wide audience. Although today’s changes may seem minor, they’re focused on making Facebook users feel less frustrated by Facebook’s product and its various policies by better pointing confused users to resources where their questions are easily answered. In response, users whose needs are addressed will be more loyal and more likely to spend time on Facebook. In addition, the Support Dashboard gives users the feeling that Facebook is listening and cares about resolving their problems. Both the redesigned Help Center and Support Dashboard will be live today.